WILLOW POINT MARINA has the solutions to all your boating needs. Unlike most marinas, Willow Point Marina operates throughout the year. We offer storage (Summer wet and Winter dry), hauling, dockage and marine service. Our facility has all the equipment to properly handle all of your hauling and storage requirements. With our overhead crane and our portable power driven crane any boat on the lake can be hauled and handled safely. We also offer round trip transportation with our heavy duty trailers. We will haul your boat, transport it to your home, block it and re-launch in the Spring at the Marina. 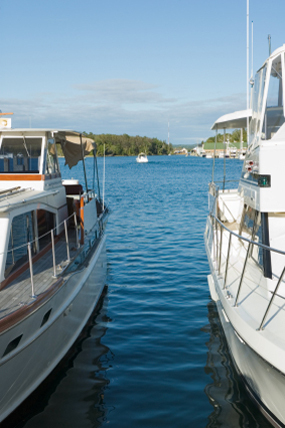 Our facility can accommodate your boat year-round with summer wet and winter dry storage. Our 150 wet slips can handle boats up to 30'. Transient dockage is also available and welcomed. Tell your friends to come and enjoy the amenities and views the Marina has to offer. Service answers are just a phone call away�or stop by and discuss your service needs with one of our informative full time service mechanics. We are a complete marine service facility. Inboard, I/O, or outboard Mercruiser, Mercury, Johnson, Evinrude, Yamaha and Suzuki are serviced by our highly trained mechanics. Winterizing and shrink wrap services are also offered.